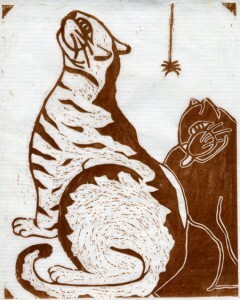 My major influences for this piece were Japanese woodblocks of felines. In many prints, the artists depict domestic cats stalking various smaller animals, most often goldfish or mice. To me, this act represents an imitation of wild cats stalking their prey. And yet, domestic cats also enjoy the ability to beg food from their owners, and thus gain power over them. For the cat on the left, I was trying to capture the idea of a cat begging for scraps from the dinner table; that appearance of trying to look cute while at the same time giving off that sad, hungry gaze. He stares up, searching for that silver platter full of already captured food. His companion on the right contentedly bathes herself, happily unaware of the world around her. Her sense of self-sufficiency is overwhelmingly present although she sits in the background. Neither cat is aware of the one threatening things to break that sense of security; a singular spider hanging from the ceiling.